For years we believed that we need to eat dairy products to provide calcium for strong and healthy bones, but the truth actually lies elsewhere: fruits and vegetables that have higher calcium absorption. This article will give you information about other options for better sources of calcium and how much of them you need to consume. If you have a look through your bone tissue, you will find a living and dynamic tissue that is very sensitive to our way of life. Bone is constantly in the process of loss and construction: until the age of 30 or so the pace of construction exceeds bone loss and we reach to the peak of bone mass. Then there is a balance between the processes of bone loss and bone building, but at about the age of 40 there is decrease in the rate of bone construction that starts the process of bone loss, which increases at around the age of 50 in women and age 70 in men. Advanced bone loss will eventually lead to osteoporosis, a condition in which the bones become weak and brittle. This condition increases the risk of fractures, especially in the hips, wrists and vertebrae. Osteoporosis can be described as the disease of old age but we build our bones from a young age. Therefore, you need to make sure to start and prevent it from a younger age. See more information in my article discover the 4 steps to prevent osteoporosis. But what is the ideal nutrition for our bones? are there better sources of calcium than dairy products? In a recent article published in the journal JAMA Pediatrics, leading scientists from Harvard University claim that milk provides significant amounts of protein and other essential nutrients, and may provide health benefits for children and adults with poor nutritional quality. But for people who enjoy a nutritious diet – which includes greens, legumes, nuts, seeds and enough protein – researchers claim that the nutritional benefits of milk consumption probably don’t outweigh the negative effects. There is no doubt about the importance of calcium for the bones, but there is a dispute about the amount required, as reflected in the recommendations for calcium intake over 50 different countries: in New Zealand and Australia it’s 1,300 mg, in the United States 1,200 mg, in Scandinavia 800 mg and in the UK 700 mg – nearly 50% less than in the United States. Harvard researchers claim that the recommended amount in the United States is primarily based on three studies that lasted three weeks or less, and probably this recommendation is higher that what the body really needs. Is It Possible to Get Enough Calcium Without Dairy Products? The recommended calcium intake in the U.S. is high, and some argue that without dairy products this daily intake cannot be practically achieved. People aged 50 and older need 1,200 mg of calcium as stated above, the age group of 19-50 needs 1,000 mg, the age group of 9-18 needs 1,300 mg, and 800 mg is required for ages 4-8. 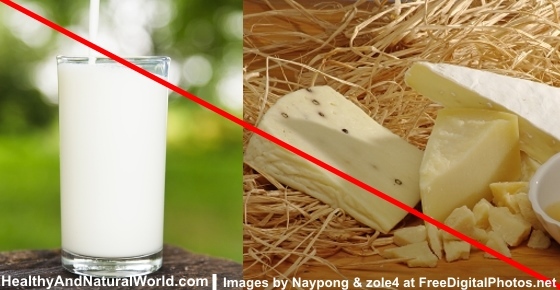 It is important to know that three dairy products provide only about 600 mg of calcium on average, about half the recommended intake, when it is assumed that balanced diet will provide the remaining calcium. However it is possible to provide all the necessary calcium intake through plant food sources only, although it may not be easy for many of us. This list is only an example of course, and there are other good plant sources for calcium, such as: okra, Brussels sprouts, pumpkin, butternut squash, butter beans, leeks, artichokes, celery, coriander, Chinese cabbage, kale, tangerines, carob products, hazelnuts, Brazil nuts, flaxseed, fenugreek and poppy seeds. Does Calcium from Plant Food Sources is Absorbed Well in Our Body? Except spinach and Swiss chard, which has absorption rate of only 5%, calcium is absorbed well from plant food sources. The absorption rate of legumes, nuts and seeds is 21% -27%, and the highest calcium absorption rate – 50% to 60% – is from green vegetables like kale, arugula and broccoli, roughly twice higher in comparison to dairy products whose absorption rate is about 32%. For example, 100 ml of milk (half a cup) contains 100 mg of calcium, and 100 grams of broccoli (about two-thirds cup) contains 50 mg, but the amount absorbed is similar: about 32 mg from milk and 30 mg from broccoli. Most of us think of the skeleton as a calcium casting, but your bone is composed of 40% protein, and calcium in the end is only half of its contents. Also, a proper functioning required various nutrients in addition, for example – calcium and vitamin D which helps in calcium absorption. Vitamin K – Participates in bone building and reduces urinary calcium excretion. Can be found in green vegetables: various leaves, broccoli, Brussels sprouts and okra. Antioxidants: Lycopene and Beta Carotene – These are antioxidants that fight many diseases, including osteoporosis. Can be found in red fruits and vegetables such as tomatoes and watermelon, orange fruits and vegetables such as carrots, pumpkin, mango, and green leaves. Potassium – Helps in creating an alkaline environment in the blood, known as protecting the bone. Can be found in greens, sweet potatoes, broccoli, melon, fig, orange, nuts, seeds and legumes. Read more about potassium in my article about potassium deficiency – causes, symptoms and what to do. Magnesium – Helps in creating alkaline environment in the blood, is essential for creating vitamin D and required for the metabolism of calcium. Magnesium can be found in green leaves, seeds, almonds and beans. Read more about magnesium in my article about top signs that you have magnesium deficiency and what to do about it. All the above components received recognition for their contribution for bone health and are reflected in the latest recommendations of leading health organizations such as the National Osteoporosis Foundation (NOF). Also the dietary supplements market is not left behind, and today you can find specialized calcium supplements containing additional minerals and vitamins such as magnesium and vitamin K. These supplements aim to mimic the diversity and combination of the existing components found naturally in plant food sources. Potassium and magnesium are also found in dairy products, but in a smaller amount than in plant sources. Vitamin C, vitamin K, beta-carotene and lycopene are found only in plants. What You Should Not Consume? Sodium (salt) is very harmful to the bones because it increases calcium loss in the urine. The main source of sodium in the modern diet is processed foods, so for this reason it is recommended to prefer home-cooked food. When buying packaged food, it is recommended to check the sodium content, compare brands and choose the best product that is relatively low in sodium. Food containing less than 100 mg sodium per 100 grams is considered low sodium. Cabbage, for example, contains a moderate amount of calcium that is absorbed at maximum rate. It also contains vitamin C, vitamin K, beta-carotene, potassium and magnesium, but on the other hand does not contain sodium. However, hard cheeses are among the richest in calcium but have lesser absorption rate of cabbage. Also they don’t contain the beneficial components mentioned above, and they are rich in sodium. Harvard researchers also refer to the broad health effects of various calcium sources, and point out that while the hypothesis that dairy products protect against colon cancer, it has been found that high consumption of dairy products can probably increase prostate cancer risk and maybe ovarian cancer risk as well. In this regard, you can also read my article about a research that recommens to avoid consuming large amounts of milk. However, according to dietary guidelines issued by The American Cancer Society (ACS), a diet rich in vegetables (especially cruciferous vegetables, such as broccoli and cabbage) and legumes is associated with a reduced risk of prostate cancer. Moreover, the high consumption of fruits and vegetables is associated with a significantly decreased risk of colon cancer. To summarize, similar to other diseases common in the Western world, the risk of osteoporosis decrease through appropriate diet rich in quality plant food sources. It is recommended to get the calcium we need from plant food sources such as vegetables, legumes, nuts and seeds, and consume dairy products in moderation. The plant food sources provide, in addition to calcium, a unique package of nutrients that work together to maintain bone and general health.